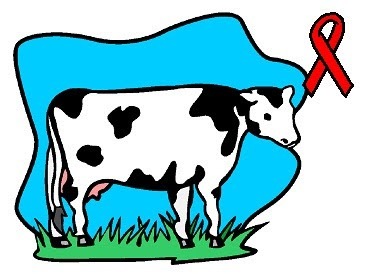 The Queerstory Files: HIV : Do Cows Give Us Sweet Hope? Lgbt (lesbian, gay, bisexual, transgender) history for everyone. No academic gobbledigook. No deep analysis. Just queer facts. There's still a lot of bigotry around but there's also lots to celebrate. HIV : Do Cows Give Us Sweet Hope? Tomorrow is World AIDS Day. More than three decades after HIV was discovered we still can’t develop a vaccine for it, though there are several areas of research that offer hope. Last year one new line of hope came from a surprising source – from the origin of the word “vaccination” itself – cows. Vaccination also links us back to my article on Monday in which Lady Mary Wortley-Montagu featured. Going back to one of my earlier articles about her we learn that Lady Mary was instrumental in bringing the practice of smallpox inoculation into the West and influencing Edward Jenner’s pioneering experiments in vaccination. The research with cows which is giving hope of developing an HIV vaccine was undertaken by the International AIDS Vaccine Initiative (IAVI) and was published in the journal “Nature” in summer 2017. The report’s author was the Director of Antibody Discovery and Development, a young, openly gay, organic chemist called Dr. Devin Sok. Like an industrious ant Devin Sok has followed a sugary trail that that led him to IAVI and research into HIV and cows. In 2004 Devin began studying chemistry at Stanford University, earning a bachelor’s degree four years later. With his specific interest in organic chemistry and glycans he went to study for his PhD at Scripps Research Institute. After a while he seemed to be drifting around the various laboratories with no real focus for the future and he was on the verge of moving to Harvard when someone suggested he have one more look at the labs at Scripps. Devin found one where he could study glycans and have challenging research to follow. The lab was run by Dr. Dennis Burton, co-Chair of the Scripps Department of Immunology and Microbiology. He was also the Scientific Director of IAVI’s Neutralising Antibody Centre. This provided Devin with a definite aim in his research, and he began working on how glycans can help create HIV antibodies. While at Scripps Devin helped to co-found a group in 2011 of lgbt scientists in the San Diego area called QuEST – Queer Engineers, Scientists and Technical Professionals. It included members from several universities and laboratories around San Diego, including the Scripps Research Institute. I’ve mentioned glycan several times. What are they? They are also sometimes called polysaccharides. I can’t claim to be any kind of expert in biology but from what I can gather glycans are sugar molecules that coat most animal and plant cells. They act as a sort of shell or envelope and are more complex than the sugar I put in my coffee a few minutes ago. The HIV cells are also coated with these glycans which protect them. Thankfully scientists have found out just about everything there is to know about HIV cells, their structures and DNA. Unfortunately, there are thousands of strains of HIV and each has a different DNA sequence. Since the 1990s scientists have known that HIV has holes in its glycan envelope. However, HIV evolves quickly and it soon mutates to fill a hole. Scientists have yet to find any means of targeting them and getting antibodies to push their way through them. Denis Sok’s 2014 doctoral thesis was on the subject of finding weaknesses in the HIV glycan envelope. Glycan holes are just one area of research into a possible HIV vaccine. One other main area is into research into antibodies produced in HIV-infected humans. These have tended to be produced about two years after the patient is infected. However, only about 10-20% of infected people produce them, and as I sad earlier, HIV can mutate to protect itself and the antibodies produced don’t protect the patients against the new mutations. It has also been difficult to replicate these antibodies to make them work for immunisation. Which is where the cows come in. No, not to provide the milk to go with the sugar in my coffee but because of their immune system. Devin Sok and his Scripps Institute colleagues have been experimenting with animals that HIV doesn’t effect. They are injected with HIV immunogens (molecules designed specifically to create the production of antibodies) to see if the animals produces the appropriate antibodies. There were some antibodies produced but none of them were anything resembling those produced by the 10-20% of HIV patients. At Scripps there was a professor carrying out general research on the antibodies in cows and Devin worked with him to find out if cows cold produce the appropriate HIV antibody. After the cows were given the HIV immunogens they began producing antibodies within two months, a surprising difference to the two years it takes in humans. Even though cows can’t contract HIV they were producing antibodies against it. Devin’s research elicited a lot of media attention because of the unusual bovine emphasis. The new cow antibody doesn’t produce an answer to the problem of creating an HIV vaccine but it helps us to look into how cows can create the antibodies so much quicker than humans and see if their structure can be replicated in patients. It’ll be a long time before scientists work out all the answers and solutions. Could the cow antibodies themselves work as a vaccine? Could they attack glycan holes in the HIV envelope? If cowpox vaccination helped to eradicate smallpox could the cow’s HIV antibody help eradicate the virus in humans? Devin Sok’s continuing research into glycans and antibodies is just one of the many areas that many talented scientists are working on, and it is encouraging that new research provides hope that an HIV vaccine will be possible in our life-time. I was born during a thunderstorm in the summer of 1960 and was brought up in a village in north Nottinghamshire. I attended the sort of school which practiced “history for girls, geography for boys”, but developed a love of history none-the-less. The End is Nigh - Or Is It?